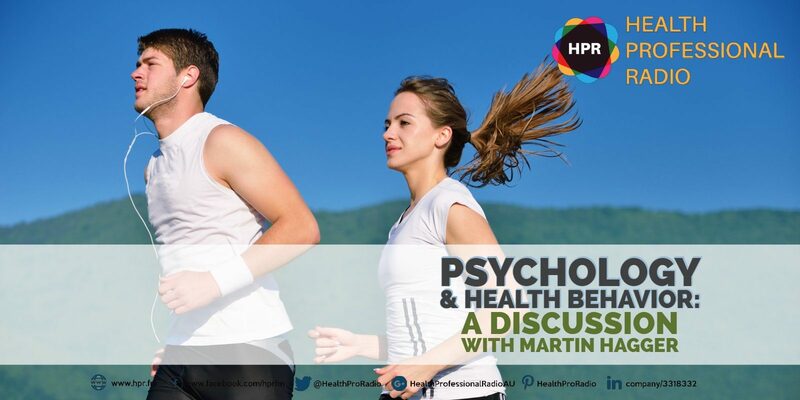 Curtin University Professor of Psychology Martin Hagger joins HPR to discuss his recently published research focused on how psychology is connected to the decisions people make in terms of their health behavior and how this information can create new strategies, campaigns and policies that can help change their behavior. Guest Bio: Professor Martin Hagger is from the School of Psychology at Curtin University. He is also a Finland Distinguished Professor in the Faculty of Sport and Health Sciences at the University of Jyväskylä. His research applies social, cognitive and motivational theories to understand and to intervene and change diverse health behaviours. Wayne Bucklar: You’re listening to Health Professional Radio. My name is Wayne Bucklar and in this episode of Health Academy, I’m joined by Professor Martin Hagger. Now, Martin is with the School of Psychology at Curtin University. He’s a Finland distinguished professor in the Faculty of Sport and Health Sciences at the University of Jyväskylä and he joins us today from Western Australia. Martin, welcome to the show. Martin Hagger: Thanks very much, pleasure to be here. W: Now you’ve recently published some research and your research has been looking or applying to social cognitive and motivational theories to understand, and intervene and change diverse health behaviors. Tell us about your research. M: Yes, so we are very much interested in how we can use psychology to understand the decisions that people make in terms of their health behavior and how we can use that information to come up with strategies, campaigns, policies to help change their behavior. And when I talk about behavior, it can be anything from health promoting behaviors like doing physical activity, eating healthily to getting people to refrain from unhealthy behaviors. So stopping smoking, reducing alcohol consumption, those kinds of things. But it could also be things in clinical context so for example one of the major problems in clinicians’ experience is getting people to adhere to their medication. So all those kinds of behaviors and coming up with things that work and more effective in changing people’s behavior. W: Now I’ve read or seen somewhere that basketball coaches have argued that mentally practicing throwing a basketball is almost as good as physically throwing it. Is this the same area of research? M: That’s right. So the most recent research that we’ve done is been looking at mental imagery or visualization. So that is just rehearsing in your mind the exact steps and the processes, visualizing yourself actually doing the behaviors. And you’re right, that is supposed to replicate the steps and the processes that people actually do when it comes to doing those behaviors. And we find that people who mentally imagine or visualize doing the behaviors are much more effective in carrying them out, they have a much better cognitive map or structure when it comes to doing those behaviors in the future much more motivated to do them as well. W: Now I can kind of see how that works and I can understand that for things like throwing basketballs, or eating smaller meals or exercising. How does it work for the negative things? How do you visualize not drinking? M: I mean that’s one of the things that we ask people do and much of the imagery that we talk about is getting people to imagine themselves in particular situations. We also get them to imagine the scenarios where they might face things like temptations. So for example if somebody is trying to cut down on their alcohol intake and you need to be motivated in order to do this kind of thing. So it’s not for people who are not interested at all. So if people have a goal or an idea that they want to cut down on their alcohol intake or whatever the behavior is, then we put them in the situation where they might drink too much and we ask them to visualize what alternatives they might do in order to reduce their alcohol intake and then we leave it up to them. So we’re getting to do a little bit of practice of it with the imagery and then we leave it up to them to visualize the kind of alternatives that they can come up with because often, alcohol is a good example. Often, when you’re faced with a situation where you might drink too much, so say you’re down the pub with your friends and your friend says to you, “Would you like another?” Now when you’re in that situation, the default is, “Yes, I will” because that’s what you’ve always done before and also there’s a social pressure or norm to do that kind of behavior. So what we ask people to do is to visualize that situation and come up with an alternative because more often than not, when they are in that situation, they don’t have an alternative so they fall back on what they’ve done before. So the visualization helps them come up with these alternatives and then in that situation when they’re confronted with that situation, at least they’ll have that alternative. Of course, it might not always work but at least they have something rather than nothing in that situation. W: Yes, I’ve been a smoker for much of my life and one of my pet hates when I was giving up smoking was that you would be happily going through your day not thinking about cigarettes at all and you’d come across a billboard that said, “Stop Smoking” and it immediately wanted me to smoke, immediately led me to to think about smoking and to then go into a whole craving cycle. So I was always so impressed at the power of negative suggestions. M: Yes and that’s one of those ironies is that actually there are cues all around us and to some extent, we don’t realize that and the things that trigger the kinds of behaviors particularly if there’s an addictive component. Things that trigger those kinds of behaviors are all around us and actually, one of the things that smokers and people who perhaps drink too much or eat too much of the wrong things are confronted with is that a lot of our behaviors are socially constrained or socially cued. So as a smoker, you’ll know when you want to smoke because it’s the times you typically smoke, it’s first thing in the morning with the coffee, it’s after a meal, it’s with your friends down the pub, that kind of thing. And so being aware of those situations and having strategies to manage those is extremely important. And you’re right, you showed actually quite keen awareness when you’re actually looking at signage and those signs were actually a trigger to smoke. And as you are aware of that and actually to some extent, that would help you trying to give up smoking because part of the battle is actually realizing when these triggers happen and putting into place something to manage those. Okay, whether it’s something for example like avoiding those situations. So actually one of the research suggests that the people who are most successful in changing their behavior are actually those who strut to their lives so they don’t get tempted. So for example, classic example is if you know you’re a snacker, don’t have snacks, there’s no snacks available. I mean that’s fairly tried example but actually, it can work. And so having those kinds of alternatives or being able to manage those triggers is extremely important. And this research that we’ve recently done on imagery suggests that can be a tool to help people think about those kinds of alternatives. M: Yes. So researchers like to talk about things like effect sizes. How strong is giving people some imagery likely to translate into some actual behavior change? And our research suggests we have a small to medium-sized effect so that means that probably around about half the people who do imagery exercises are more likely to change when it comes to behaviors like physical activity. Now you might say, “Well only half the people?” Well that’s better than none and it’s way better than none. And actually when we talk about those kinds of effect sizes, that is actually quite what they call a “Clinically Significant Effect,” it’s very, very important compared to nothing. If you assume with those people who didn’t do the imagery intervention, the imagery exercises, if you assume that those people would go ahead and not exercise or not do the behavior. W: And of course, if you’re one of the half that are affected, then you’re not at all concerned about the other half who are not. M: Well, that’s right. I mean it’s not a question, we want to try to maximize the benefits of any intervention that we do of course. But of course in these interventions, there’s a huge amount of variability in the population. If I was a scientist working with chemicals or in pharmaceuticals, that’s just a bunch of equations. You have a formula and you get an output, that’s very simple. When you’re working with people, it’s not that simple. There’s lots of factors, it’s multifactorial and people don’t necessarily do what you want them to do. But what we’re trying to do is to come up with strategies that have maximum effect for the most number of people. So sometimes, it can be frustrating that people don’t do what you want them to do but at the same time, at least life is not boring, there’s always a problem to solve. W: That’s true and with sport and psychology, you have picked disciplines where it’s never boring. W: Martin, you published in the Journal of Health Psychology, congratulations on that publication. I understand that it’s never an easy thing to get a piece of work through the process and published. For people who are interested in your research, can they reach out to you? M: Absolutely. So I have a website, martinhagger.com. So that’s where we have preprints of all the articles we publish and of course, I can be found on the Curtin University website as well. And yes, we also have materials that are available online. So for example, we have a guide on how to use mental imagery and I’m more than happy to share that with people. It’s through some work that we did with actually the Malaysian Ministry of Health and they were interested in using imagery to change people’s behavior. So we have a quite a comprehensive easy-to-use language or simple clear language resource that people could use to use this kind of imagery intervention. W: And that’s available at martinhagger.com. W: Martin, it’s been a pleasure chatting with you today, thank you for your time. W: I’ve been in conversation with Professor Martin Haggar from the School of Psychology at Curtin University. And Martin is just recently published some work in the health psychology journal related to using mental imagery intervention or visualization of an activity or a task and how it may be effective in helping people to change their behaviors. And Martin has just been telling me that that effect is a moderate effect that probably is effective for half the people who try it. So if you’re interested, you can gain those resources that Martin was talking about at his website, martinhaggar.com. And if you just joined us on Health Professional Radio and you’ve missed the interview, the good news is the entire interview is available as a transcript on our website. You can also hear it as an audio archive on SoundCloud, YouTube and iTunes. You’re listening to Health Professional Radio, my name is Wayne Bucklar.